Romantic Suspense trilogy with the irrepressible, irreverent Maggie Kean! Art teacher and sculptor, Maggie Kean, thought she was having a rotten day--burning her toast, stubbing her toe, all before eight in the morning. Things just couldn't get any worse. At least, not until she discovers her neighbor's dead body in her front yard. And it didn't stop there. Before she can claim her innocence, Maggie becomes the primes suspect in the investigation. 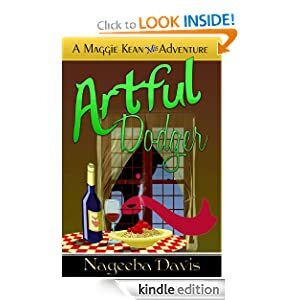 Now all she has to do is evade the police, clear her name, trap a killer...and deal with one mouth-watering, hunky detective who drives her crazy while making her hormones do the happy dance!